This triumph came in the form of winning the Hill Club Golf Networking event at Kingswood in Surrey. The event was well supported with twelve teams made up of groups of suppliers and buyers from the world of cleaning. Duplex played with Dave French and key customer, Mike Richards from LVC as his guest. 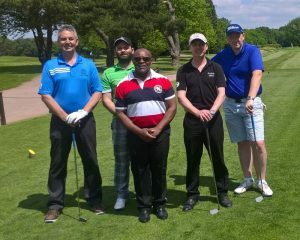 Duplex’s Barry Wilmot supported the day by running a fun “nearest the pin” competition for each group on the 10th hole. It was a beautiful day with sun cream substituted for umbrellas as the summer showed signs of making its presence felt. Many thanks to Cleaning Matters who organised and sponsored the day with plenty of money raised for charities. Bandits ! Cut their handicaps !